Visiting Brazil, an earthquake hits and separates a family from their beloved cat, Purrball. Purrball’s mad dash leaves her lost in a jungle where she becomes fast friends with a very clever sloth named Burrball. The two quick-witted animals embark on a journey to find Darryl, the loving and loyal boy who longs for his adorable missing cat. 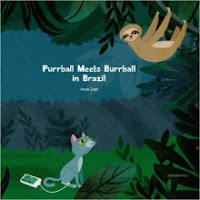 Witty word rhythms and rich illustrations make Purrball Meets Burrball in Brazil an engaging read-aloud story. 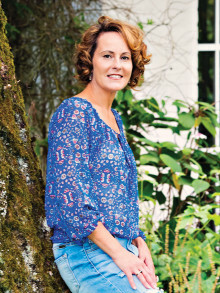 An alluring tale of friendship, family, ingenuity, and persistence. I’m crazy about both domestic and wild animals and it is a passion that just gets deeper all the time. I’ve done a lot of research on cats (on nutrition and behavior) as well as love to build cat structures and make toys for them. And, I do not know who could look at a sloth and not smile! They have the sweetest faces and they have so much more to them than the “ sloth” slowness we think of. They’re rather industrious buggers and have some funny quirks, like the wildlife that grows in their fur. I firmly believe they should never be pets and should be kept wild. While the story is pure fantasy (as are stories where animals communicate with phones! ), I really want to keep one a pet and the other wild and be true to my feelings about that and it would be so lovely to pass all that along to children! I think my grandson would love this book!